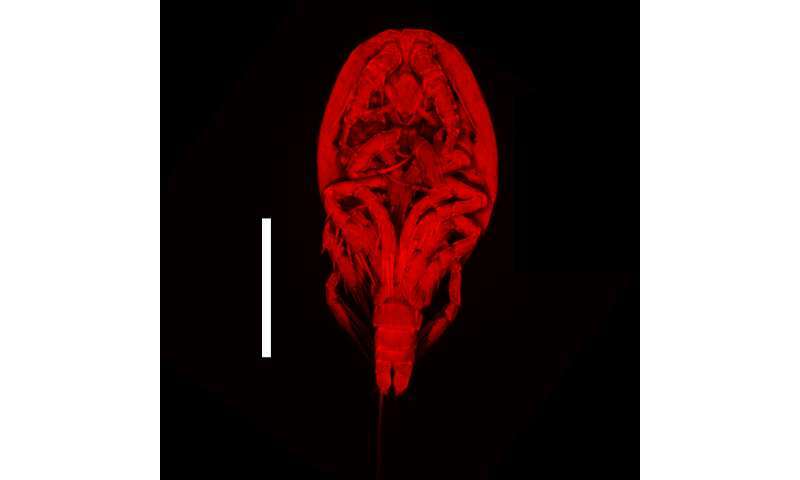 A new species of microcrustacean was collected from a submarine hot spring (hydrothermal vent) of a marine volcano (Myojin-sho caldera) in the Pacific Ocean off the coast of Japan. This crustacean group is found only in deep-sea hydrothermal vents and is the first of its kind found in Japanese waters. A new species of microcrustacean (Stygiopontius) was collected from a hydrothermal vent of a volcanic seamount (Myojin-sho caldera) in the Pacific Ocean off the coast of Japan. This crustacean group lives only around deep-sea hydrothermal vents in the central Atlantic or eastern Pacific Oceans. The new species is the first of its kind discovered in Japanese waters. Reina Senokuchi, a Kumamoto University student, was the first to make the discovery saying, "When I realized that it might be a new species, I was both delighted and very surprised. I couldn't believe it was true." There are many hydrothermal vents in the deep waters east of Japan. The water in these vents is heated by volcanic activity under the ocean floor blown into the sea. In the vicinity of these openings, bacteria function as the primary producer of organic matter and convert mineral resources contained in the hot water into energy, a process called chemosynthesis. The organisms here are not found in any other type of environment on the planet. Some can be found in vents throughout the world's oceans, yet others appear to live only in specific areas. A research group headed by Associate Professor Motohiro Shimanaga of Kumamoto University studies the ecosystems of deep sea hydrothermal vents. Between 2012 and 2014, Dr. Shimanaga's group surveyed hydrothermal vents in the calderas of three submarine volcanos in the Izu Islands (in the Izu-Bonin Arc) and collected samples of organisms to learn more about these mysterious life forms. 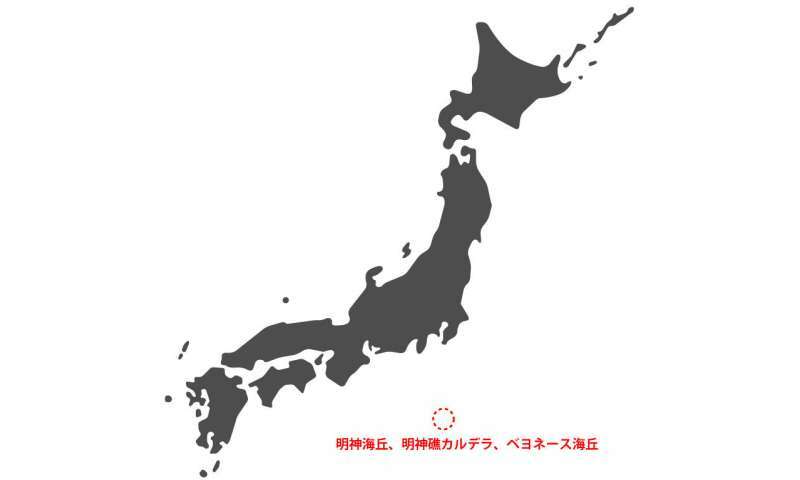 The area surveyed included hydrothermal vents at depths between 800 and 1400 meters in the Myojin-sho caldera, the Myojin abyssal hill, and the Bayonnaise abyssal hill, which are about 420 km south of Tokyo. Researchers mapped the areas and retrieved samples using an unmanned deep-sea sub. One of the samples included the new species of Stygiopontius, a type of copepod. Copepods can be found all over the earth. They are ecologically important because they feed on phytoplankton and are a food source for many other creatures. Until this discovery, copepods of the genus Stygiopontius had only been found in deep sea hydrothermal vents in the center of the Atlantic and East Pacific Oceans, but not in the deep waters east of Japan. When Ms. Reina Senokuchi, a student of Kumamoto University at that time of the study, examined the copepod from the Japan coast sample, she discovered that it had several morphological differences compared to other species of the genus Stygiopontius. Both male and female specimens of the new Stygiopontius species were found at all three investigation sites, with body lengths of 685 to 786 micrometers for females and 446 to 483 micrometers for males. Assistant Professor Daisuke Uyeno of Kagoshima University, an expert in morphological analysis of microorganisms, conducted an analysis of this tiny copepod and published a paper on the group's findings. The new species was named Stygiopontius senokuchiae after its discoverer Ms. R. Senokuchi. "I was very happy because I did not think it would be named before I graduated. It was definitely worth the effort to sketch out the microscopic observations," she said upon hearing the news. "Our next challenge is to figure out how this species adapted to the deep sea hydrothermal vent environment," said Ms. Senokuchi's mentor, Dr. Shimanaga. "We are also very interested in clarifying just how this species has spread from one hydrothermal zone to another, since the distances between the vents are relatively large."